Traveller's guide on how to recognize a saint when seen in a painting while visiting a museum or cathedral. 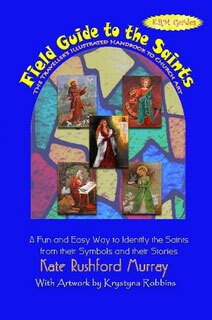 A new ‘adventure‘ fell into my lap a few years ago when a friend recommended me to a New England writer, Kate Murray, for illustrating her new book—a Field Guide to the Saints. In the beginning that seemed simple since I am a devout Catholic and had already been painting Saints for more than 20 years. But the project eventually involved painting eighty three 9x12 original oil paintings of Saints chosen by the author. (Click HERE to see the 83 paintings.) As I researched each one, there was such a rich and colorful history of each one. I was amazed by the things some of these Saints had done and how they persevered in difficult circumstances. A Field Guide to the Saints: The Traveller's Illustrated Handbook To Church Art provides a fun and easy way to identify the Saints found in churches and museums, and to learn their stories. Especially designed for travellers visiting southern Europe (but relevant anywhere that Saints are found), this book allows you to solve the mystery of "Who is that Saint?" It's a thrill to decode these images using the easy-to-read identification "clue list," and doing so can make visits to churches and museums a truly fun experience, a game anyone can play. --Try identifying some of the Saints by clicking here.. If you are headed to Europe, bring this delightful, authoritative, and practical book along! You'll love reading the stories of the Saints. The material is engaging and slightly irreverent, but always informative.